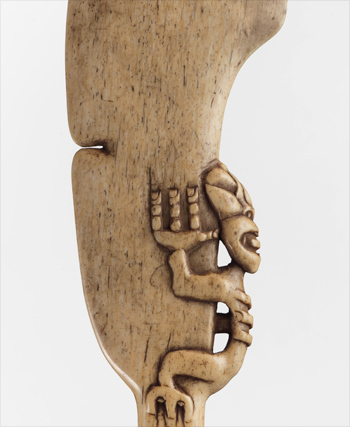 The use of traditional Māori weaponry declined after Europeans arrived in New Zealand. Weapons such as taiaha (fighting staffs) were replaced by muskets, and para whakawai (weaponry training schools) vanished. Since the 1980s, as part of the Māori cultural renaissance, there has been renewed interest in traditional weapons – although a narrower range than were once in use. Warfare and weaponry were an important part of traditional Māori society. Children were prepared for warfare from an early age, including through play activities such as boxing, wrestling and stick-throwing games. In the para whakawai (weapons training school) young men learnt mau rākau (the use of weapons). They were instructed in battle formations, weapon use, and attack and defence moves, and took part in mock battles using reeds instead of weapons. Rakanga waewae (skilful footwork) was important. To Māori, weapons were taonga (treasures), and were often handed down to descendants. Weapons were made of wood, stone and bone, in a slow, painstaking process. Karakia (incantations) were sometimes said over weapons to imbue them with deities and make them tapu (sacred). spear-like weapons such as pouwhenua, koikoi and tararua. Short one-handed weapons were called patu. They were held in one hand and a mat was wrapped around the other arm as a shield. After Europeans arrived in New Zealand, the use of Māori weapons declined. Taiaha were quickly replaced by muskets (firearms). Over the years para whakawai stopped operating and many tribes lost their knowledge of weapons. Since the 1980s there has been a revival of traditional weapons as part of the Māori cultural renaissance. A small number of para whakawai have been set up, mostly within a tribal framework. Weapons are used during the wero ceremony (ritual challenge to visitors), in kapa haka performances and whaikōrero (speechmaking).